It's fair to say that I'm a complete mix of both my parents. I definitely love my diamonds, people with manners, and a tailored true Southern room, aka so my Mother. But then there's the person who turns up the volume way too loud when a true great classic song comes on like Gimme Shelter, curses at times, and someone who will then let those manners go straight out the window, because I've learned life is too short. Can we say Bob Hamilton's daughter? I am someone who appreciates an unstructured room, a completely modern space, and that floral blue and white southern dining room. I chuckle a lot when I think about how different my parents are. My close friends can't believe they got married, they're just so different. They were destined for divorce. But luckily for me those two completely different people got together, made me, and put all their different parts of themselves into me. In relation to design, it's made me appreciate many different styles. I may not want an entire room filled with just blue and white florals and patterns, but I admire it for it's beauty. So today, I would like to show appreciation for lots of different styles of design. I adore each of these rooms for a different reason, and I appreciate what each designer has made me feel when I look at the space. Can you guess which ones my Mother likes? Never in my wildest dreams would I think I'd ever like pink or lavender. Yet another example of never say never. This is the color of our bedroom and I have to say every time I walk in my bedroom I think to myself how much I love the color. Oh chocolate brown sofas, you get me every time. For a space like this, you have to think location. Palm Springs and Miami for a vacation home, this is perfect. wallpaper, gold, chandelier, oh my!!! blue, on blue, on blue. Does this not make you want to curl up and read a book? Oh zebra wood!!! note, by painting the trim the same color as the walls, it doesn't distract from the desk. Why hello there green chair! 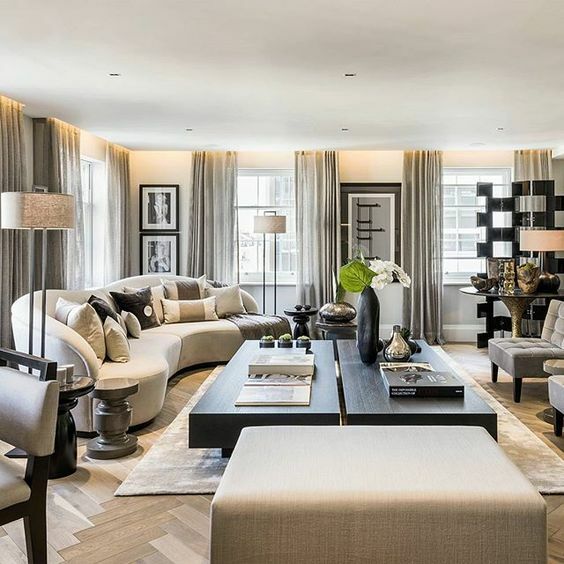 A grey monochromatic space that doesn't feel cold, but yet, bright and inviting. How cute would this be for a little boy's room?! Thanks so much for reading! I apologize for being gone so long. I went back home for a bit while my Dad had surgery. I intended to get so much work done, but y'all the guy doesn't have internet! Needless to say this was a running joke with all his visitors that stayed at the house. "What's your Dad's wifi password?" "he doesn't have internet!" "what?" Y'all his ipad works from "up there". All he knows is his ipad works from the sky. Dad, I love you, don't worry, I'll still visit even though you don't have internet. Maybe you're thinking "hey, she grew up having Sunday dinner at this formal table, with candles and fresh flowers every week. 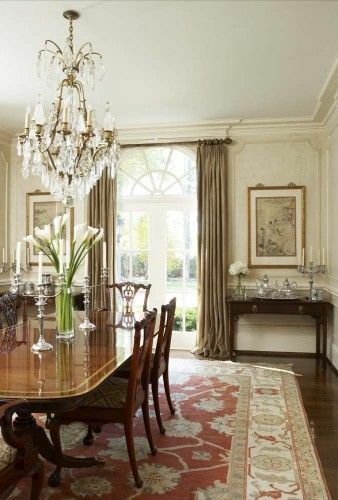 Of course she wants a formal dining room." Well, part of that is correct, I grew up with a beautiful Duncan Phyfe dining table, that is so shiny it looks like glass. I had the silver candlesticks, and flowers, but they were faux. However, funny enough, I've only eaten on this table twice in my entire life. The first time was when my Mother was out of town and I was staying there and I had a few girlfriends over and we ordered pizza and they suggested we eat at the dining table. I enjoyed that meal, but I'll be honest, I was scared shitless that they would put the tinest scratch in the table because nothing gets past my Mother. But she never found out and a few years later I told her and she laughed and thought it was great. Who knew. The second time was a year or two after Brad and I got married and she wanted to host Thanksgiving for my Dad, Brad, and myself. I couldn't believe it. Y'all I actually ate on the fine china, that sits perfectly placed in the cabinet and we lit those candles, and drank and had a wonderful time. However, I was again scared shitless that Brad would mess the table up. Let's just say he's not the most careful and doesn't truly appreciate nice things. Now here's the thing, if you've followed along with this blog, or know my parents and myself, you know that my parent's couldn't be more different. They were destined for divorce. But as my Dad says, "it all worked out, we got you." Such a Dad response, right? But my Dad is the one who let's the boys ride their scooters in the house and doesn't fret when they've "accidentally" smeared blueberries into his rug. Meanwhile my mom has hired someone to put brown butcher paper on the floor so they can ride a toy meant for a 1 year old, yet they are 3 and 5. My Dad will go out and spend hundreds of dollars on a nice meal, with great company, and say "yea, it was expensive, but we had such a great time." When I'm visiting and my Mother, the boys, and myself come back in my Dad's house we're greeted with music so loud it's deafening and him doing some crazy arm, leg gyration. My mother shakes her head, and says, "some things never change." But what I've learned from both of my parents is to appreciate your finer things and treat them good, yet enjoy them because life is too short. Make those memories at your dining table. Pour yourself another glass of wine, and enjoy the company. Now sit back, and take it all in, you're in a beautiful dining room, with a glistening chandelier, the crystal is clinking, and everyone is having a night to remember. All out of sight from a dirty kitchen and a large black television. So I'm leaving you with lots of dining room inspiration. Maybe you have an open floor plan house now, but maybe down the line when you're looking for your next house, think about how special a separate dining room would be. Or if you're thinking of opening everything up in your house, pause, and think how maybe a few separate rooms could still work with your open concept dreams. Yes, yes I know Mother, the table and chairs are similar to yours. A formal dining room doesn't have to be "fussy"
Maybe it's because I'm from the South but I sure love a formal living room. You see, I dress my boys up in those smocked outfits with the knee high socks and saddle oxford shoes, even though I know that they will stain the hell out of that white shirt and no amount of Oxy can help. And those shoes stand no chance to scuffing, but I still buy the outfits because they look good. I sometimes will sacrifice comfort for aesthetic. I can't help it. It's like I can't help having expensive taste. It just comes naturally to me. It seems nowadays that with social media helping disperse any photo around, things have gotten stale. Now that's not to say that rooms I see on Instagram aren't pretty. But it just seems like our homes are now trends, just like the cheap, inexpensive clothes you can buy. Again, because of social media. There is no identity to our homes. You find a photo you like, and then copy it at your big box store. And you know what? Your neighbor, your sister, your best friend just did the same thing and guess what? You all have a room or a home that is identical, or feels pretty damn similar. Listen, I understand wanting to "finish" a home. However I'd rather wait to find the perfect, just right piece of furniture or art rather than just buy something to buy something. My Mother has always taught me to save for the best you can get. That in the end you're just wasting money on that cheap coffee table. Now I get it, IKEA is great for college, but most people reading this are adults. Are we so much in a "I want it now" place in our country that you can't wait to find that really unique side chair, that when your guests come in they comment on it? I feel like HGTV, because it's our main home TV channel dictates a lot of what people want nowadays. And listen, I don't blame them, but why must we open everything up? Can we not have formal living and dining rooms where maybe, just maybe, we sit without the TV on and have an adult conversation with a nice cocktail in your never been used crystal? I'll never forget just a few years ago Brad randomly said to me that he's always wanted a white room. Now this was out of the blue driving down the road, so my first thought was "oh my gosh I'm rubbing off on him! He's thinking about interior design!!" My second thought was, "well hell no, we have 2 boys." Then I pushed that thought out about 20 seconds later and said, "a living room. We'll have a formal white living room." I know, now you're thinking, yea right, you have 2 boys! Well you know what, I can have a nice home and still have children that feel welcome in it. But my boys know that couches and chairs aren't meant to be jumped on, crazy enough, they are to sit. Now that's not to say I don't see secret jumps, but when did it become ok for our kids to just take over every space? Now granted I'm a girl, but I'll tell you what, I grew up in a house with so many breakables and didn't break one. Yes, yes Mother, I know, that one time when I was looking at the lapis clock and you told me not to touch it I picked it up. But damn, it must have weighed 20 pounds! I dropped it and put a chip in her chest and a dent in the clock. Mother, that was over 30 years ago, it's time to let it go! Y'all, she still talks about it! But guess what? After that I knew never to touch certain things. Can we not teach our kids that you are welcome in the living room, but you must have certain manners to be in there. And maybe I'm on this rant because I'm the only female in my house and there seems to always be sports on, but I desire to have friends over and talk and hear my crystal clinking in my white living room with no eyes darting to the score of the big football game. So, I'm going to leave you with a lot of unique, one of a kind living rooms, that you can't find at your local big box store. These are spaces that designers have spent time scouring trying to find the perfect chocolate brown cotton velvet, or a sconce that has a hand applied gold leaf, because mass produced gold just isn't the same. They have spent the time to make each of these rooms special in their own way. So before you go and buy something just to buy something, pause, and take some time to see if you can find something that will make your space, or your home stand out against others. Be honest: you want to have a grown up talk with other grown ups in this room? I am so into monochromatic rooms lately. And well, I've always loved oversized furniture so those cabinets have me swooning. Just look at that wood grain coming out in that stain! Who says white has to be boring? It can set the stage for other aspects of a room to draw attention to. I'm ready to use that color of the sofa in a study today! Put a petrified wood stool / table in any space and I'll love it! Yet another example how chocolate brown and white work so nice together. Don't forget about your fifth wall in your living room, your ceiling. I'm not normally a periwinkle fan but this room has me thinking otherwise. Thank you so much for reading. I truly hope that with every post I write I inspire you, but especially today. Maybe you're in the middle of a renovation, don't just immediately knock down all the walls. Maybe you can leave 4 walls up and have a special room. A room where some really great conversation is had and memories are made.